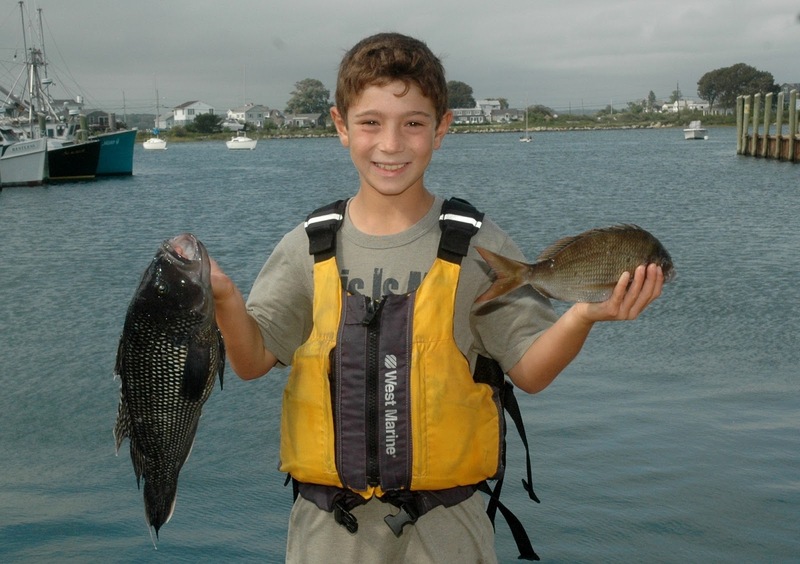 Most trophies: Joey Scrofani of Wakefield, RI with two nice fish… a black sea bass (left, 3.60 lbs.) that took 1st place in the Junior Division and scup (right). Joey also took home the 1st place trophy for the largest Junior Division bluefish at 6.40 lbs. 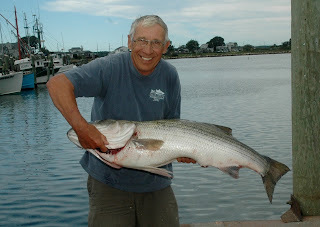 Top fish: Ray Jobin of Charlestown, RI took first place in the Tournament Boat Division with this striped bass that weighed a healthy 37.10 lbs. All smiles: Fishing for a Cause Tournament participants Joel Cooper (left) of Smithfield, RI, Dave McCormick of North Kingstown, RI (center), and Jeff Eastman of North Attleboro, MA (right) . Measuring up: This 28 lbs. 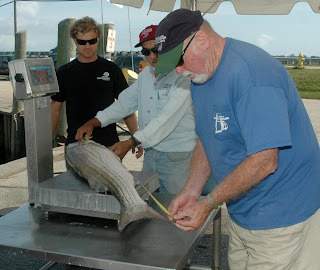 striped bass caught by Andrew Raucci (left) of Wakefield, RI gets weighed in and measured by Ed Carney, RISAA board member (right), at the Galilee Fishing for a Cause Tournament and Food Festival. The First Annual Galilee Fishing for a Cause Tournament and Seafood Food Festival was “very successful” said Steve Medeiros, president of the Rhode Island Saltwater Anglers Association (RISAA). “Even with the weatherman forecasting bad conditions, we still had 148 registered anglers… this is not bad at all… and yes, there will be a Second Annual Galilee Tournament and Food Festival.”, said Medeiros. The three day Tournament and Food Festival was organized by the Town of Narragansett, the Department of Environmental Management (DEM), and the Rhode Island Saltwater Anglers Association. Funds raised from the tournament and food festival will be donated to Hasbro Children’s Hospital, Narragansett Parks and Recreation Financial Aid Program, and the Johnnycake Center of Peacedale, RI. The Galilee Fishing for a Cause Tournament and Seafood Festival aims to celebrate and promote Rhode Island’s recreational and commercial fishing industries. Organizers wanted to create an event reminiscent of the past tuna tournaments held in Galilee, Rhode Island to help create awareness and interest in fishing and seafood in Rhode Island. Recreation and commercial fishing displays and demonstrations were held throughout the festival with participation from a variety of commercial fishing interests such as Superior Trawling and the Rhode Island Party and Charter Boat Association. The Festival featured local seafood, artisans, music, and educational exhibits. Black sea bass Junior Boat Division winners were 1st place Joey Scrofani (3.60 lbs. ), 2nd Zoey Realeau and 3rd Shawn Rogers. Bluefish Junior Boat Division winners were 1st Joey Scrofani (6.40 lbs. ), 2nd Michael Morrison and 3rd Jack Spych. Bluefish Adult Boat Division winners were 1st place Dave Kops (13.15 lbs. ), 2nd John Eldridge and 3rd Stephen Daignault. Bluefish Adult Shore Division 1st place winner was Joshua Richardson (11.75 lbs). Fluke Adult Boat Division winners were 1st place Ed Sylvia (3.10 lbs. ), 2nd Jared Henry and 3rd David Fewster. Scup Junior Boat Division winners were 1st Nate Ambrad (2.25 lbs. ), 2nd Zoey Realeau and 3rd Joey Scrofani. Striped bass Adult Boat Division winners were 1st Raymond Jobin (37.10 lbs), 2nd Peter Vican and 3rd Jonathan Lewie. Striped bass Adult Shore Division 1st place winner was Richard Reich (8.5 lbs.). Deepwater Wind (developer of the pilot wind farm project off Block Island) will hold a Block Island Wind Farm and Transmission System informational meeting and open discussion with the Rhode Island fishing community on Tuesday, October 9, 2012 from 4:00 p.m. to 7:00 p.m. at The Village Inn, 1 Beach Street, Narragansett, RI. If you are a recreational or commercial fisherman (or anyone else for that matter) and want to learn about the project or have a concern about the proposed wind farm you should attend. Learn about the fisheries data that has been collected and what research is proposed as the project moves forward. For further information contact independent fisheries consultant Rick Bellavance at 401.741.5648 or www.biwffisheries@gmail.com . Tautog fishing is heating up as anglers start to target this species. Legal size is 16” minimum with a limit (until October 19) of three fish/day/angler with a maximum of ten fish per boat. JR Carlow reports on the RISAA blog, “I got out with my dad on Friday for some tog. We hit the ledge at the corner of Castle Hill, right where the Coast Guard cutter comes out, if you follow the shoreline out to the front of the Inn at Castle Hill. Got nine keepers and a total of 17 fish in about 2 1/2 hrs. All on Asian crabs. Slack tide too. Took the best five home.” I fished in the mid/lower Bay Sunday and caught many shorts and two nice keepers in the 20” range in the General Rock, North Kingstown area in a matter of 1 ½ hours, 2.5 hours before low tide. Once the current slowed, the fish shut off. I was using green crabs, chumming with a mixture of clam bellies and green crabs. 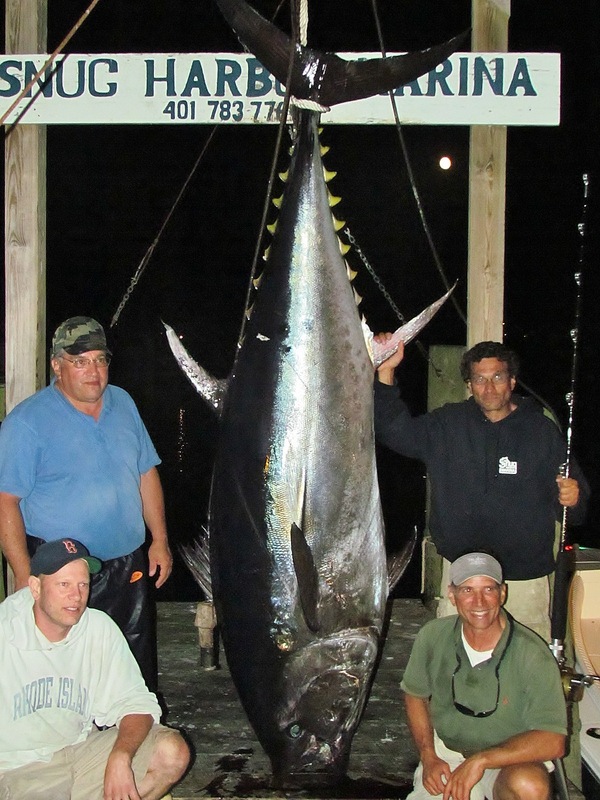 Giant bluefin caught after five hour fight: This 763 pound tuna was caught by David Appolonia, South Kingstown, RI (bottom right), his second giant bluefin in ten days. 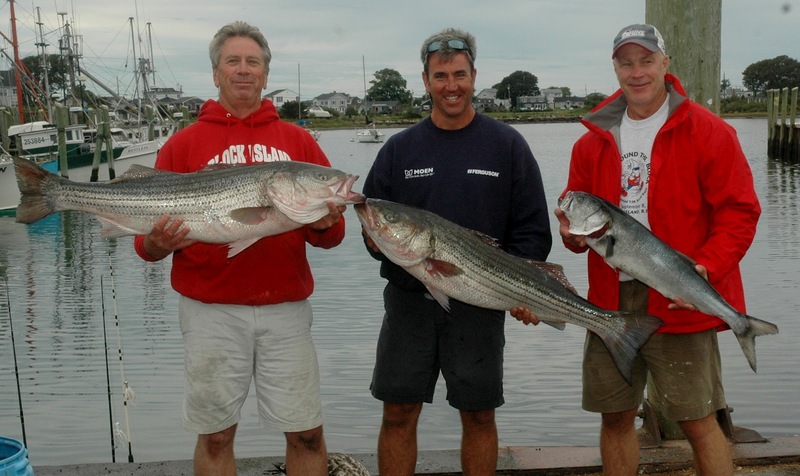 Lenny Upham (bottom left) of Cranston and Appolonia’s brothers Felix (top left) of West Warwick and Eric of North Kingstown (top right) were part of the team that caught this giant. Photo by Capt. Louis DeFusco. 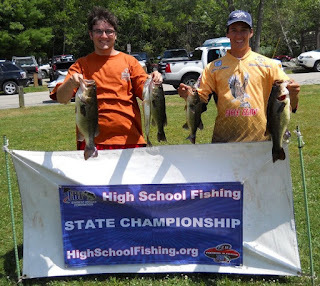 State champs: Pat Crabtree and Chris Catucci of Bishop Hendricken High School, Warwick are getting ready for the freshwater fishing High School Eastern Conference Championship in Virginia on September 15. Pat and Chris shown here as they finished first in the State of Rhode Island with a largemouth bass five fish limit weight of 14.5 pounds. Fishing for giant bluefin tuna off Rhode Island coastal shores hasn’t exactly been productive for sport fishermen for the past several years. In fact, many have taken to fishing off Cape Cod as bluefin tuna have been more plentiful and larger in that area. But this season, with very few fish around in waters off Rhode Island, David Appolonia of South Kingstown, RI and his crew managed to boat two giant bluefin fishing the waters south of Block Island. 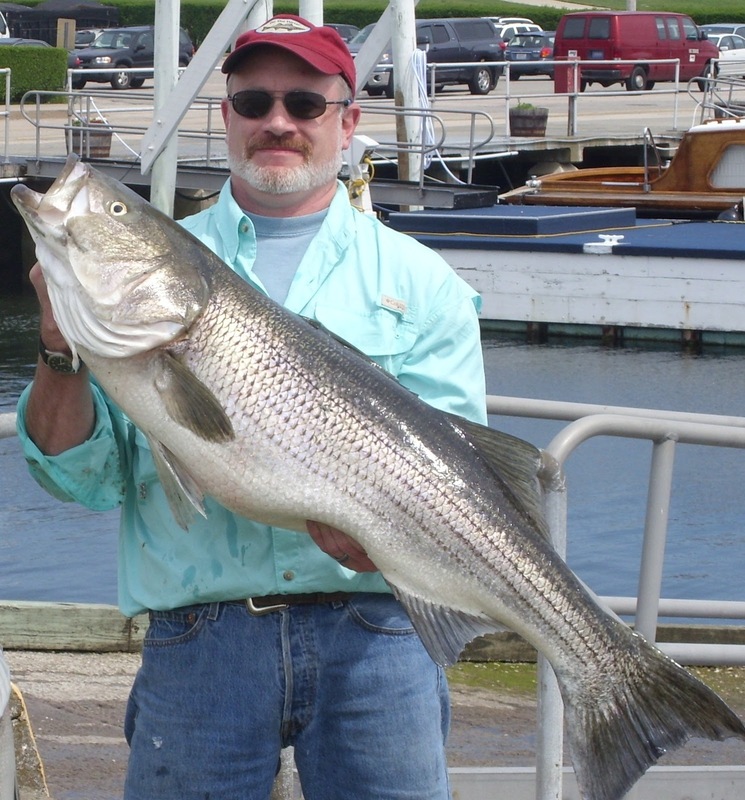 His second fish, 763 pounds and 108 inches long, arrived at Snug Harbor Marina, South Kingstown, RI after sunset. Just ten days earlier, Appolonia brought a 730 pound bluefin to the same dock. “We were anchored and chumming when we picked up the fish at 12:10 p.m. We thought we would luck out as it surfaced in 45 minutes but then sounded and it took five hours to land. Lenny harpooned it and my brother Felix gaffed the fish. We got the tail tied at about 5:15 p.m. It took us about two and a half hours to get back to Point Judith.” said Appolonia. It is important to note that all three of David’s giant bluefin tuna were caught on his 26’ Regulator. Well done and congratulations David, Lenny, Felix and Eric on a very nice fish! David Appolonia and his crew members are writing new chapters in the history of Rhode Island giant bluefin tuna fishing. The National Marine Fisheries Service (NMFS) was in Rhode Island Monday to hear directly from Rhode Island fishermen about issues facing the industry. John K. Bullard, who was recently appointed to head the National Oceanic and Atmospheric Administration’s (NOAA) Northeast Regional Office of the National Marine Fisheries Service, and Bill Karp, who was recently named Science and Research Director for NOAA’s Northeast Fisheries Science Center met with fishermen in Narragansett at what was billed as a “listening session”. Senators Jack Read and Sheldon Whitehouse along with DEM Director Janet Coit organized the meeting. Anglers are urged to catch only what they plan to keep, then lay of the striped bass as the mortality rate of released fish under these conditions is likely very high. Tautog fishing is still slow. Anglers catching some small tautog off Black Point in Narragansett. “Divers are reporting a good number of tautog but not many anglers are targeting them yet.” said Mary Dangelo of Maridee Bait & Tackle. John Littlefield of Archie’s Bait & Tackle said, “Small tautog is being cauth at Conimicut Point, Colt State Park and at Ohio Ledge with few keepers in the mix at this time.” A good tautog bite reported off the Castle Hill area of Newport. Scup fishing remains strong at Colt State Park, Ohio Ledge and off Conimicut Light said John Littlefield of Archie’s Bait & tackle. Night fishing pays off. Greg Vespe, an East Bay area resident, has successfully completed 375 night striped bass fishing trips on Narragansett Bay. “I fish at night to catch quality fish… it’s not as dark as you think out there.” Greg with a striped bass he caught a night on the Bay. Large black sea bass taking eels off Block Island. Ralph Battista (executive chef at Luigi’s Restaurant & Gourmet Express in Johnston, RI) landed this monster 6 pound black sea bass last week on the Southwest Ledge. 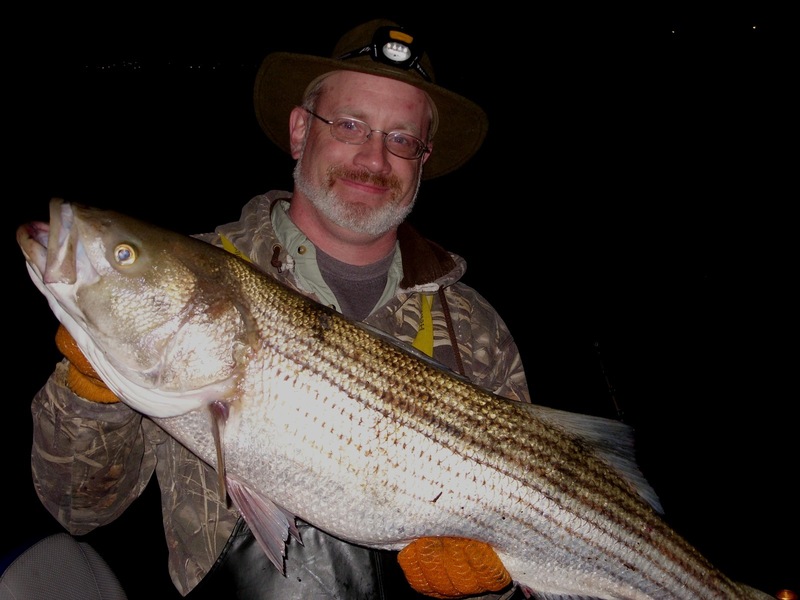 Greg Vespe has successfully completed 375 night fishing trips for striped bass on Narragansett Bay. He fishes for three types of striped bass. The first group he targets are spring fish, the second are transit bass and the third he refers to as “resident grubbers”. He spoke last week at the Rhode Island Saltwater Anglers Association (RISAA) monthly seminar and shared tactics he uses to target these fish from early May to October. Greg, who generally fishes from his 14’ aluminum boat (and occasionally from shore) finished 16th out of 1,500 anglers in the Striper Cup Angler of the Year competition in 2009. So he is an accomplished fisherman. He suggests anglers should have confidence in their boat and ability to navigate at night. “Go out during the day to the exact spots you plan to fish. It is not like day time fishing where you go from spot to sport and are consistently moving. I pick three spots, going to the furthest one first set up and fish and then progressively move to locations closer to the boat ramp.” Once you select a location you settle in and fish that spot. If the squid are running in the spring, he prefers to fish the lower Bay with squid rather than chasing menhaden and bass up the East Passage and Rivers. The transit fish come into the Bay in July and August at night to feed in the lower Bay, they are aggressive fish but do not tend to hold long. The “resident grubbers” are the fish that target lobsters and crabs, they tend to be loners and are often beat up from feeding off the bottom. Here are some night time fishing tips from Greg. Anchor so your bait is on top of the structure, not necessarily the boat. He usually fishing in 6 to 20 feet of water, but if the bottom looks broken (with a lot of structure) in 40 feet of water he will fish there too. Often times he uses two anchors so he can position the boat and be able to move it to take advantage of the structure as the tide and current change. Be quite and stealth when fishing for bass. His favorite bait is squid in the spring and early summer May, June and July and uses a whole squid, fished two feet off the bottom, changing weight as the current changes. As the water heats up he usually switched to eels, however, once the rods (he fishes three) are set he often throws plugs with his spinning rod and reel. Now is the time to express your thoughts about the Rhode Island fishery. Attend the Rhode Island Marine Fisheries Council meeting Monday, September 10, 6:00 p.m. at the Corless Auditorium, URI Bay Campus, and South Ferry Road Narragansett, RI. Agenda items will include a review of 2012-2013 recommendations for winter shellfish management area schedules, and 2013 commercial fishing licensing. Also agendas for the new day long advisory panel meetings DEM and the council are experimenting with will be reviewed including summer flounder, scup/black sea bass and the Atlantic herring ad hoc committee panel.